Replacement Robert Shaw natural gas (LP) valve for Hearth & Home gas stoves and fireplaces. This is for propane gas. This valve is for standing pilots only, does not work with DSI, HSI and IPI models. Fits the following HHT gas fireplace models. G112HA & G112HAL - Robert Shaw Valve only. G360S & G360SL - Robert Shaw Valve only. G520CL & G520CLL - Robert Shaw Valve only. G520CR & G520CRL - Robert Shaw Valve only. G760CH & G760CHL - Robert Shaw Valve only. G920FL & G920FLL - Robert Shaw Valve only. GC112 & GC112L - Robert Shaw Valve only. GC300FL & GC300FLL - Robert Shaw Valve only - Pre 21/96. GC300ST & GC300STL - Robert Shaw Valve only - Pre 21/96. 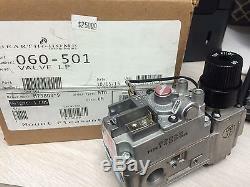 GC400SF & GC400SFL - Robert Shaw Valve only - Pre 21/96. GC720 & GC720L - Robert Shaw Valve only. GC920 & GC920L - Robert Shaw Valve only. CGC150 & CGC150L - Robert Shaw Valve only - Pre 39/95. CGC300 & CGC300L - Robert Shaw Valve only. CGC400 & CGC400L - Robert Shaw Valve only. G136 & G136L - Robert Shaw Valve only. G160 - Robert Shaw Valve only. G200 & G200L - Robert Shaw Valve only. G270 & G270L - Robert Shaw Valve only - Pre 41/95. G420 & G420L - Robert Shaw Valve only. GC100A & GC100AL - Robert Shaw Valve only. GC150 & GC150L - Robert Shaw Valve only - Pre 39/95. GC300 & GC300L - Robert Shaw Valve only. GC340 & GC340L - Robert Shaw Valve only. GC341 & GC341L - Robert Shaw Valve only. GC341A & GC341AL - Robert Shaw Valve only. GC361 & GC361L - Robert Shaw Valve only. GC400 & GC400L - Robert Shaw Valve only. GC420 & GC420L - Robert Shaw Valve only. GC1990 & GC1990L - Robert Shaw Valve only. GC2000 & GC2000L - Robert Shaw Valve only. Heat N Glo Gas Fireplaces. 5000GDV - Robert Shaw valve only. SL-32 - Pre Mid 1996. The item "Hearth & Home Robertshaw Valve 060-501 LP Gas Fireplace, Heat & Glo, Heatilator" is in sale since Thursday, October 29, 2015. This item is in the category "Home & Garden\Home Improvement\Heating, Cooling & Air\Fireplaces & Stoves\Replacement Parts". The seller is "builderbuddies" and is located in Byron Center, Michigan. This item can be shipped to United States, Canada, United Kingdom, Denmark, Romania, Slovakia, Bulgaria, Czech republic, Finland, Hungary, Latvia, Lithuania, Malta, Estonia, Australia, Greece, Portugal, Cyprus, Slovenia, Japan, China, Sweden, South Korea, Indonesia, Taiwan, South africa, Thailand, Belgium, France, Hong Kong, Ireland, Netherlands, Poland, Spain, Italy, Germany, Austria, Israel, Mexico, New Zealand, Philippines, Singapore, Switzerland, Norway, Saudi arabia, Ukraine, United arab emirates, Qatar, Kuwait, Bahrain, Croatia, Malaysia, Brazil, Chile, Colombia, Costa rica, Panama, Trinidad and tobago, Guatemala, Honduras, Jamaica.